This page has an historical overview of the Territory in 1986. The New Year opened with the Northern Territory News reporting that Australian Parks and Wildlife was investigating the illegal landing at Uluru by 3 parachutists, who attempted to land on the rock on the first day of the New Year. “We will prosecute” they claimed. Reports of New Year celebrations included that the packed Diamond Beach Casino at Mindil Beach, resembled ‘a sardine can’ as new year revellers saw in 1986. Popular Darwin venues Darby’s Nightspot, the Beachcomber, and Fannies were crammed with people swaying to the music. Territorian Mr Jay Pendarvis, owner of the Mudginberri Abbatoir, exporter of Buffalo meat, was named Australian of the year. Ian Tuxworth MLA resigned as Chief Minister in May. Steve Hatton MLA became the third Chief Minister of the Northern Territory. Early in the New Year the NT Government announced the auction sale of Annaburroo Bark Hut Inn, billabong and camping area for tourism development. Contracts in order of $6M were announced for the development of Tindal RAAF Base. In the early days of the year, the newspaper reported that “more youths will hit the prison system following the transfer [on 6 January 1986] of Youth Services to Correctional Services”. Landscaping plans for the low lying land behind Vesteys Beach in Darwin were released for public consultation. A new Post Office was designed and designated for the budding town of Palmerston. On 8 April 1986 international super-band Dire Straits played their “Brothers in Arms” concert to a thrilled audience at the Darwin Showgrounds. Rain soaked the crowd but not their enthusiasm. Dire Straits also played at Uluru on 11 April. There were full page advertisements regularly in the NT News warning of the dangers of drinking alcohol and driving a motor vehicle, with the stark message that Drink Driving kills. Local Darwin attractions Indo Pacific Marine, located at Smith Street West, Aquascene Fish Feeding at Doctors Gully, the Crocodile Farm at 40 mile, and The NT Museum of Arts and Sciences (now the MAGNT) were on the tourist ‘to do list’ for visitors to Darwin. On 30 June 1986 the Australian Bureau of Statistics conducted a census. Results indicated that the Australian estimated resident population had reached 16 million, with the NT’s population around 154,400. The population of the Northern Territory although still small in comparison with State populations, had been increasing rapidly, having more than doubled in 25 years between 1961 and 1986. The NT had the youngest age profile in Australia with median age in 1986 of 25.7 years. In the Northern Territory the major centre outside Darwin was Alice Springs which had grown at an average annual rate of nearly 5 per cent in the period 1976-86. Alice Springs was one of Australia's fastest growing inland towns; its population at 30 June 1986 was 22,000. Pope John Paul II visited Australia at the end of November, blessing gatherings of Roman Catholics from his ‘Pope mobile’ on a tour of various cities and towns, including Darwin and Alice Springs. In Darwin he celebrated mass at the Darwin Showgrounds, dressed in specially designed vestments incorporating both papal and Tiwi symbols. In Alice Springs he addressed a crowd at Blatherskite Park and gave an inspirational speech to the Aboriginal and Torres Strait Islander peoples of Australia. The Australian Prime Minister was Mr Bob Hawke, and Leader of the Opposition was Mr John Howard. Sydney nurse, Ms Anita Cobby was abducted, raped and murdered by 5 men on 2 February. All perpetrators were found guilty in June 1987 and sentenced to life imprisonment without parole. Mrs Lindy Chamberlain was released from prison in Darwin in February, following the discovery of her daughter’s matinee jacket at Uluru. The Royal Commission into the conviction of both Lindy and her husband Michael began in April. Mrs Joan Child became the first female Speaker of the Australian House of Representative in the Federal Parliament. The Australia Act 1986 came into effect on 3 March, granting Australia legal independence from the United Kingdom by removing the power of the Parliament of the UK to legislate with effect in Australia, its States and Territories. The headquarters of the Victoria Police at Russell Street Melbourne was bombed, killing police constable Ms Angela Taylor. AUSSAT satellites are launched bringing television to remote areas of Australia for the first time. The new facility for the Northern Territory located near University Avenue Palmerston, was opened in July. A nuclear power plant at the Ukraine town of Chernobyl, exploded in April 1986 causing widespread radioactive contamination of the region. Hundreds of thousands of people were displaced by the disaster as the Soviet Union evacuated and closed off the surrounding area within 18 miles of the plant. Contaminated dust and air from Chernobyl blew across parts of Europe. The Space Shuttle Challenger exploded shortly after launching from Cape Canaveral in Florida USA in January 1986, killing all of the astronauts on board, and shocking a worldwide television audience. Pan Am Flight 73, with 358 people on board bound for the US, was hijacked at Karachi International Airport, Pakistan, by four armed men. Following a breakthrough commitment to disarm, negotiated during US-USSR Arms Talks between US President Ronald Reagan and Russian President Mikhail Gorbachev, Gorbachev stepped up reforms in Russia introducing Perestroika(restructuring) and Glasnost (openness). Andrew Lloyd Webber’s stage musical adaptation of the Phantom of the Opera debuted in London’s West End in October 1986. Halleys Comet could be observed in the night skies as it reached its closest point to the Earth, during its second visit to the solar system in the 20thcentury. Territorians were watching A Country Practice, Simon Townsends Wonder World, TV Series Rush, and American drama Dynasty on the television. Australian TV soap opera, Neighbours introduced the character Charlene Robinson on 17 April 1986, with actor Kylie Minogue selected for the role fresh from finishing her High School exams. John Farnham’s You’re the Voice topped the Australian music charts. Other popular music on the charts for 1986 included Billy Ocean When the going gets tough, the tough get going, and UK performers Bananarama song Venus. Sylvestor Stallone’s Rambo First Blood Part IIand Arnold Schwarzenegger’s Terminator were shown as a double feature at the local Darwin Cinema. 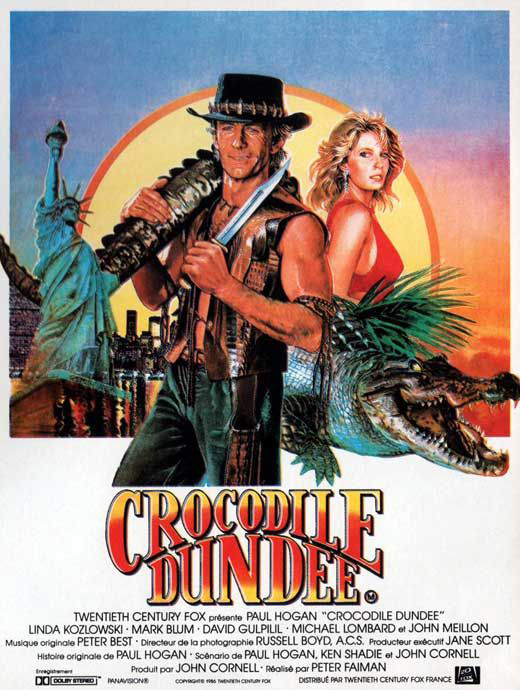 The movie Crocodile Dundee starring Australian actor Paul Hogan and American actor Linda Koslowski was released in Australia on 30 April.